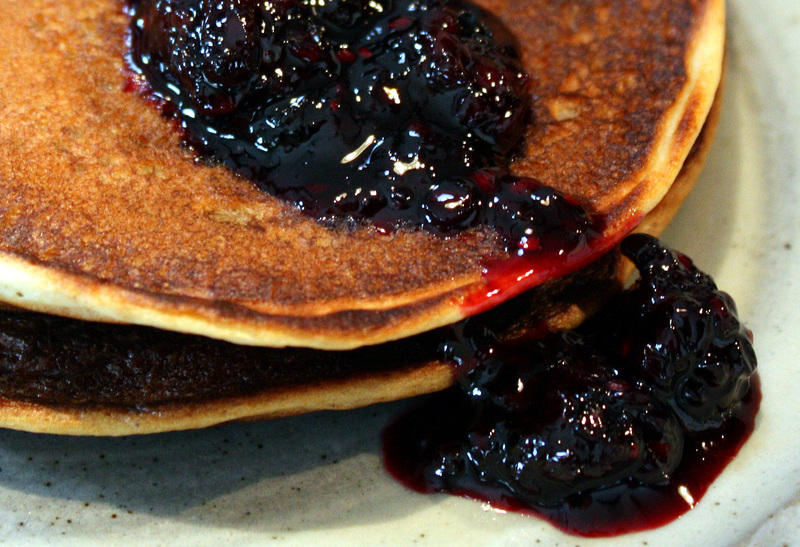 I’ve never had a no-fail pancake recipe; I think the nature of cooking with small-batch, freshly-milled, whole grain flours means that you accept much more variability in how the flour behaves and your recipes are necessarily flexible. I can usually manage this quite well, but…these pancakes just would not cook. The outsides were dark brown and seriously crispy while the middles were raw. I thinned the batter with buttermilk (and more, and more), I tried not to over stir, I lowered the heat (and again, and again), I checked the expiration date on my baking soda (Feb 2010); I even resorted to covering them while they cooked in the pan in an effort to cook the middles through; eventually I “finished” them in a 200 degree F oven just hoping to dry out the insides enough to make them edible. They were flat, dark brown and soggy from being covered in the pan. Tai, sweetheart of a husband that he is, said “Well, they have great flavor” and “they’re sort of like crepes… really!” in that silver-lining tone of voice. Then we made a few jokes about Kaela’s Crappy Crepes and the fact that, apparently, I can only make pancakes when I am not paying any attention to what I’m doing, and ate them anyway. 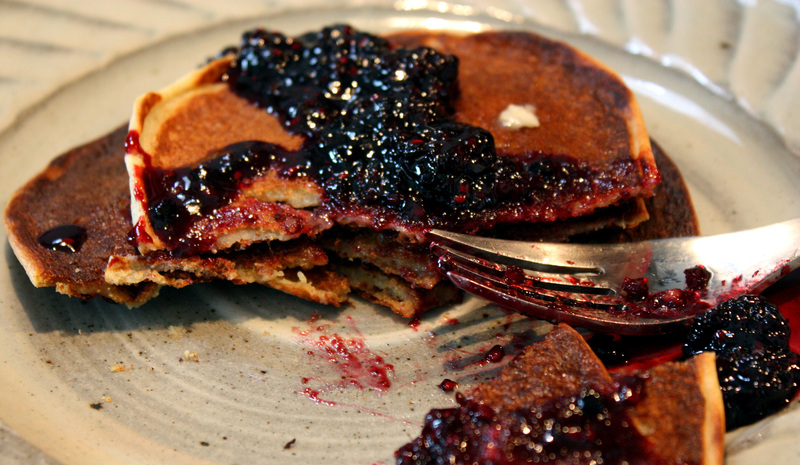 The true silver lining of the pancake debacle was the blackberry maple syrup, which Tai dubbed “outrageous.” It was ridiculously simple to make and truly outrageously good. Good enough, even, to convince us to eat an entire batch of Kaela’s Crappy Crepes with nary a complaint. What about you? Any no-fail tips or techniques for perfect, whole-grain pancakes? Clearly, I can use all the advice I can get! Whisk together flour, baking soda and salt until well-combined [sifting might have been a good idea here]. Mix the wet & dry ingredients together until just combined [I may have overmixed, a typical mistake of mine]; a few lumps is OK. Use a 1/4-cup measure to add batter to the hot pan. Cook until the edges begin to harden and the batter is bubbling in the center, about 3 -5 minutes, then flip and cook the other side. [Slice a small slit with a sharp knife to see if the middle is fully cooked, moan, curse, lower heat some more, continue to cook, repeat.] Cook one test pancake first, and adjust the heat up or down. Keep cooked pancakes warm in a single layer in a 200 degree F oven. Godspeed. Combine maple syrup and blackberries in a small saucepan. Bring to a boil over medium heat; reduce heat to low and simmer, stirring frequently to prevent sticking, until the juice thickens to a syrupy consistency and you can just smell the beginnings of caramelization, about 15 minutes. Keep in the pan until ready to serve, as the syrup will harden upon cooling. Yields about 1 dozen 4-inch pancakes and 4 healthy servings of syrup. Go to someone else’s house for pancakes, where they actually know how to cook them. Bribe them with your fantastic blackberry maple sauce. Torn into shreds and scattered under the bird feeder in the backyard. The local fauna will not care that the pancakes are thin, dense and soggy. I can screw up pancakes all year round! Gack, sorry about the frustration. I’ve noticed some variation in small-batch mill flours too…. but isn’t it great to have Wild Hive around? The syrup though, I can see eating almost everything with it!